you will get page like below. Click Drop down like mention below image. 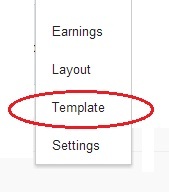 Now select Template like below. Now you will get dialog box like below. 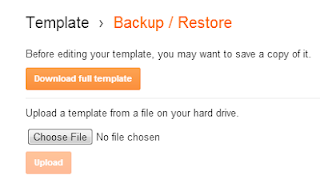 If you want to backup your template before uploading new one. 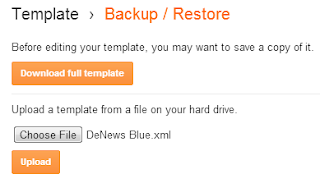 Just click Download Full Template button, it will download automatically.I think that's better, because if you got any problem with new template,after upload it. you can upload again your original template. To upload new template. 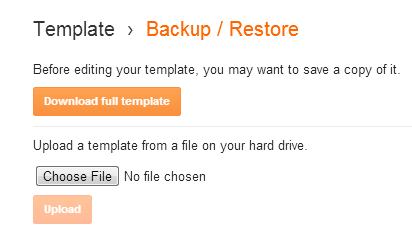 click Choose file button.Then, you can select your template from file. After selected it, Now you can click Upload button.It will upload within few seconds. Now you are uploaded it, successfully. If you have any question about it. feel free to comment below. thank you so much i use it on http://hajiforexplus.blogspot.com/ but still have problem vie page on top tab. You have a big ad or something with 4 big buttons covering part of the instructions. Blogger dashboard is now changed..Can you show the new trick? Your post is out dated and I am not able follow it.